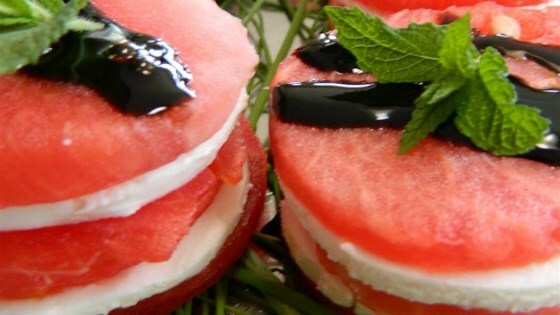 "Refreshing take on a traditional caprese salad. If you don't have a ring mold cut into squares or triangles instead. The key is flat watermelon pieces 1/4-inch thick." Season shrimp all over with onion powder, garlic powder, salt, smoked paprika, and chipotle pepper powder. Set shrimp into a baking dish. Bake shrimp in the preheated oven until bright pink on the outside and the meat is no longer transparent in the center, about 8 minutes. Use a ring mold (slightly larger in diameter than the diameter of the goat cheese slices) to cut watermelon into circle shapes. Cut circle shapes into twelve 1/4-inch thick slices. Place a slice of watermelon on a plate. Top with 1 slice cheese, 1 slice watermelon, 1 slice cheese, 1 slice watermelon, 2 shrimp, respectively, to form a salad stack. Repeat with remaining watermelon slices, cheese, and shrimp. Drizzle balsamic vinegar over each stack and garnish with basil. You can substitute regular paprika for smoked paprika, if desired. The nutrition data for this recipe includes the full amount of watermelon. The actual amount of watermelon consumed will vary. Talk about flavor combo I wasn't expecting, these flavors are just so good together.